We got an opportunity to give a presentation at OlutExpo festival in Helsinki. Of course, we love to talk about a topic close to our hearts, so the topic was The Bold and International Craft Beer. This was the first ever OlutExpo and we really didn’t know what to expect. At first, we were almost sure that that it would be a quiet Sunday and our presentation wouldn’t interest anyone. Instead, there were plenty of people interested about us and the topic. The audience was great and had quite a few questions about Sori Brewing. People seemed to be as excited as we are about this project. It was so nice to hear that! If you are curious, open here a rough excerpt of the presentation itself. Why are we talking about internationalization? Do you know how many Finnish craft breweries export their goods? How many Finnish beers can be found in Swedish alcohol monopoly, Systembolaget? The answer is, a few. And they are pretty much all by big Finnish megabreweries. Instead, how many Swedish, Norwegian or Danish craft beers have you seen in Finland? Exactly, pretty many. In our opinion, that is the problem with Finnish craft beer. We stay here on our comfort zone and won’t dare to go and introduce our great beers to the world. A few have done this, but we would love to see others do it as well. That idea is pretty much the core of our business plan. Craft beer has always been a social thing. The brewers brew collaboration beers with each other, which can help one brewery to expand their markets or make them more known. Also, craft beer is all about sharing information. There are no such things as secrets in this business. We share our knowledge and help our fellow brewers to grow. At the same time, it’s helping this industry to grow and helps us to make the bulky lager megacorporations redundant. We have a common mission, which is to bring more flavors and interesting stories to this world and make life less dull. Behind the craft beer movement always come strong persons. This industry has a lot to thank for guys that have made all this possible. Those guys you can see on TV and guys who stand against arbitrary legislation that is just doing a favor to big megacorporations. We think this industry lives from people, not just from the great beer. We need story tellers, rebels that stand up when nobody else does – real craft beer superheroes. Big, boring and bulky breweries cannot do that. It’s the people, it’s doing with your own face and not being a faceless brewery. It’s open-mindedness to do things a little bit different, do things nobody thought of doing. It’s sharing with others, caring about the industry and of course, other people. How to do this then? Collaborate and share your knowledge. Learn by doing and by discussion. Give more than you ask, the good karma always brings good things back to you. Know everyone. Be there and be everywhere. Never underestimate people, you never know who will make a difference. 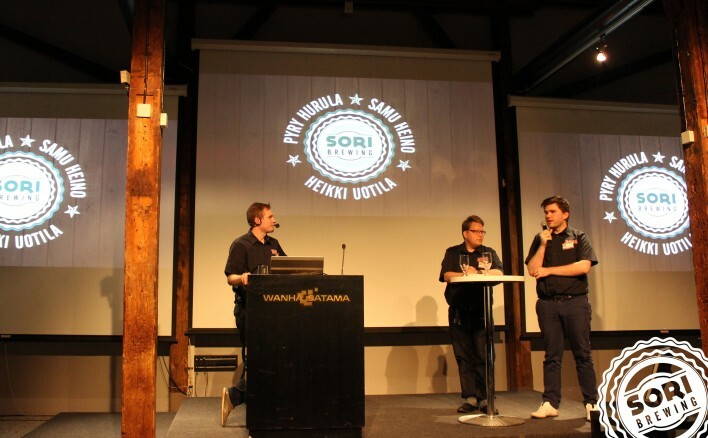 How is Sori Brewing trying to succeed in international level? Dare to experiment and explore. We go for the funky beers, as well as try new business models. Continuous renewal. Always be fresh and exciting, people want to see what you do next. Speak to the world, but don’t forget people around you. 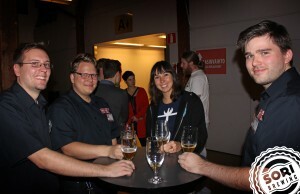 It was fun to meet all the new people in the Finnish craft beer business. 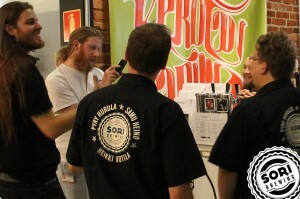 This event had breweries from Finland and representatives around the world. Scotch craft brewery Brewdog sent us their finest, Zarah Prior (the Gatekeeper) and Stewart Bowman (head brewer), to meet and greet the beer people. Brewdog is one of the rock stars in craft beer so it was fun to see how people react here in Finland. We got our share to talk with them, which was great. Surprise was that they were already heard about us. Also, we got to taste their first ever sour beer, Blitz!. It was nice, low ABV and fresh, apricot summer drink, just like it is supposed to be. Among the new breweries in Finland was Hatebrew. They have strong heavy metal / rockish vibes and Finns will definitely love that. Hatebrew guys were also so full of happiness to present their first brew to the world. We tasted it and liked it. This batch lacked carbonation, but what-a-heck, we love real ales and the flavors were there! We wait to see what they have to offer next for the thirsty Finnish beer lovers. They are planning first to work as a gypsy brewery and move from a brewery to another, which is good plan if you want to start quickly. One of the Finnish breweries that had exciting products at OlutExpo, was Beer Hunters and their Imperial Stout, Äkäpukki. We have tasted it before, but it needs a special mention. A very world class product that every beer geek should try. All in all the Expo was great fun and good place to meet people from the industry. It’s great that there is more and more events around beer even here in Finland. We will definitely attend also in next year and that time we will have our own products to introduce. For now, thank you Mikki Nyman and OlutExpo staff!